For more than 1,200 years St Andrew’s has stood at the heart of the community that was once called Sutton but which we now know as Plymouth. During these centuries the church and the city have, in a sense, grown up together, witnessing periods of war and destruction, peace and restoration, while always working together for the spiritual and material wellbeing of the community. The history of the minster may be regarded as the history of Plymouth. In February 2008 a senior city councillor called for St Andrew’s Church to be made a minster. He tabled a motion for debate inviting the council to ask the Bishop of Exeter to grant the title. He stated that the reconstruction of the church after the devastation of the war was seen as a symbol of the city’s rebirth. In his view a minster was a church which had influence beyond its parish boundaries, like York Minster and Westminster, and he believed St Andrew’s came into that category. As the Diocese of Exeter was about to celebrate its 1,100th anniversary, it seemed an appropriate time to confer the honour on the mother church of Plymouth. The council accepted the proposal and recommended that St Andrew’s be granted the designation because of its remarkable post-war inspiration to the city and the very great esteem in which the church was held. 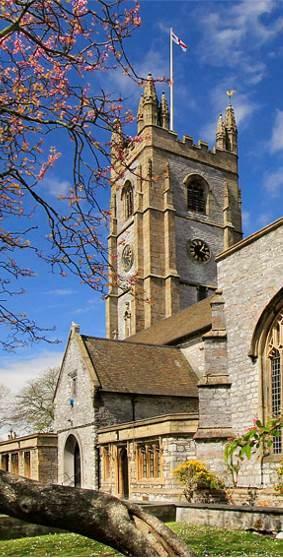 On 1st March 2009 the Bishop of Exeter announced that St Andrew’s had been awarded minster status. In October 2011, the Church Buildings Council invited parishes within the 42 dioceses of the Church of England to apply for a one-off prize of £10,000, generously funded by The Jerusalem Trust, to be awarded for the best developed proposal for commissioning a new work of art in their church. The Art Commissioning Group entered the competition and won the prize, which was shared with another church, in November 2012. The Art Commissioning Group now aims to fulfil its vision to create a work of art of the highest quality in 2017 that marks the award of minster status and the affirmation bestowed by the Jerusalem Trust.